After retiring from his position as vice-president of the commercial art firm Sampson Matthews Limited in 1958, A.J. Casson experienced a renaissance in his life as an artist. About the same time he secured a dealer - Roberts Gallery in Toronto - to oversee exhibitions and sales, which proved to be a very successful alliance. Free from day-to-day concerns, he devoted himself full time to painting, regularly heading out into the Ontario countryside to sketch. In this fresh, classic work, he depicts Sturgeon Bay off the east side of Georgian Bay, north of Pointe au Baril. 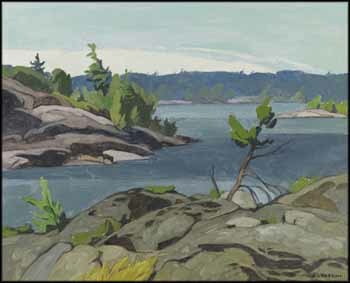 Casson's identity in the Group of Seven had been forged on his sensitive depictions of both the wilderness of Ontario and its countryside and villages. His discerning choice of a fine composition such as this was seemingly effortless - from the bay rise rocky headlands, to which iconic wind-shaped pines cling tenaciously. Tones of blue in the channels of water, misty hills and sky make Sturgeon Bay cool and refreshing, an embodiment of the rejuvenating energy of nature.